Ed note: Be warned, the following is unedited due to time constraints. Godspeed. Okay, guys, I know I owe you the second half of the Godspell post. And I’ll get to it; I swear. 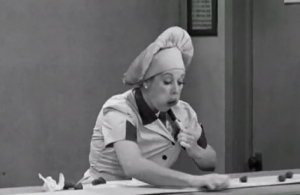 But in the meantime, the conveyor belt in my head is backing up with blog posts and well, I kinda feel like this .. Except that I can’t eat blog posts, which is good, because if I could I probably would and heaven knows, they’d be high in calories. 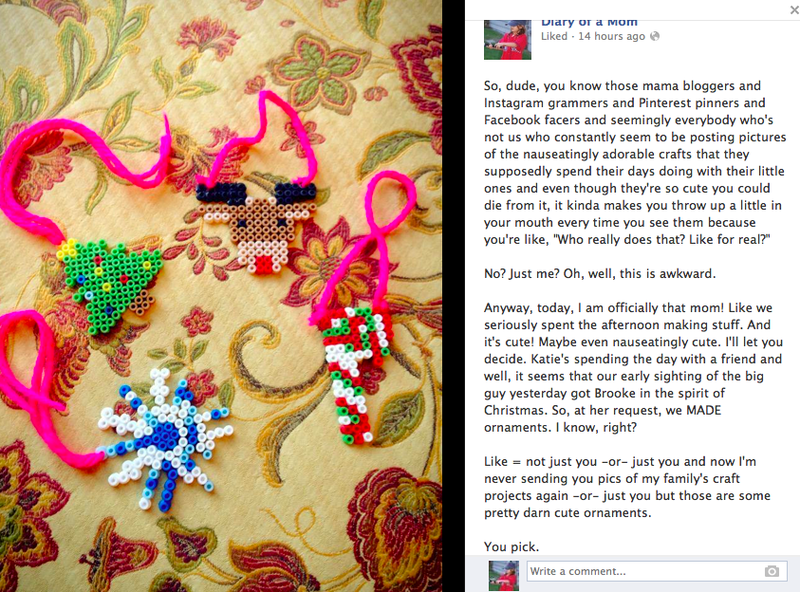 Anyway, I just have to tell you about my very last conversation with Brooke last night before leaving her room. I hope once you read it, you’ll understand why it simply couldn’t wait. But first, a little context. Which was not awesome at all. Which was so awesome that the earlier not awesome really didn’t matter anymore. So, at bed time, we had a few things to discuss. Over the course of the day, we’d talked about some rules. Brooke likes rules – the more hard and fast (harder and faster?) and the less bendable, the better. So we talked about rules. Scissors are NEVER to be used for cutting one’s own hair. Lying to one’s Mama is NOT okay. The sand must always be put out of reach of the dogs when we’re done playing with it. Pretty straightforward stuff. Except for the lying part, because that gets confusing and a little messy, but answering, “No I didn’t cut my hair,” when you’ve clearly just cut your hair? Well, yeah, that is pretty straightforward. So, at bedtime, we reviewed what we had talked about during the day. (For the record, time outs aren’t and have never been part of our repertoire, so this isn’t what happened. However, they are part of her scripting world thanks to shows like Ni Hao Kai-LAN and she relates being in trouble with getting a time out, even though she doesn’t get time outs.) If you followed that, go get yourself a piece of Halloween candy to celebrate. There are days upon days when I feel like I’m screwing this all up. And then there are days like yesterday when, impromptu hair cuts and all, I’m pretty sure I’m getting something right. You’re sure as hell doing something right. That whole conversation was phenomenal. love this. hope my granddaughter gets there. Woo Hoo! Stop making me cry when I’m supposed to be getting ready for work:) I love reading about your and B’s victories!!!! They inspire and delight me to be a better mama to my C. PS, we potty trained this weekend, and although I was SURE it was going to end in me crying or dying or running away from home… He got it! No accident since Friday! Victorious weekend all around! WOW! that’s huge. fingers crossed for continued success!!! As awesome as this is, it makes me want to cry as well. Because I wish I’d learned to lie better, instead of always trying to tell the truth. Well, not really, because I love the truth and it’s right even if rather stark and one dimensional sometimes. But my inability to tell good lies has gotten me into some very painful trouble over the years. You would probably call it being “nice” or “subtle” or “diplomatic” or “strategic”. But to me, it’s all telling lies. And I fail miserably at it. Because the rule is never to tell a lie. You’re doing a great job and yes you are absolutely right about taking it one step at a time. You’re letting her develop at her own pace. I think where things went wrong for me is that by the time I was ready to learn about “sometimes you need to be able to lie”, nobody was offering me that developmental lesson anymore. I really like your examples! I think I’m going to try those. Thank you for your perspective. It really does help me to relate better to how my daughter might be processing things. And as someone who isn’t on the spectrum, I sometimes have a hard time with these types of lies, I mean social nuances. It’s a skill that needs to be learned, as much as walking or tying your own shoelaces. And it heavily depends on reading the situation right. Which is something I have a lot of problems with anyway. But I also think that is due in part to my childhood, because by the time I was developmentally ready to socialise, the information on HOW to do that wasn’t being offered up anymore. So I’m still behind on those fronts. I’ve cobbled a social persona together from years of experience but there are still some things I miss. In all seriousness, GREAT post. It made my day. So, thank you. LOVE. is definitely the “rule!” Oh, I so love. that girl! She’s a great teacher!!! Sitting here crying. 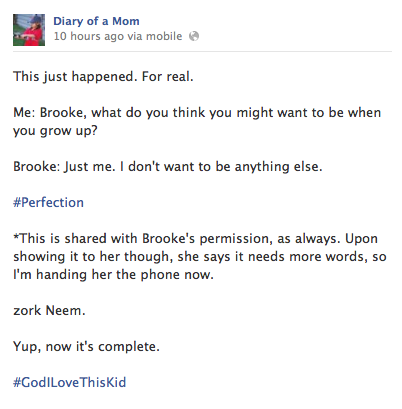 An arrow of Brooke’s awesomeness right through my heart. awwww. Mama love, the rule that is never broken. Best rule of all. 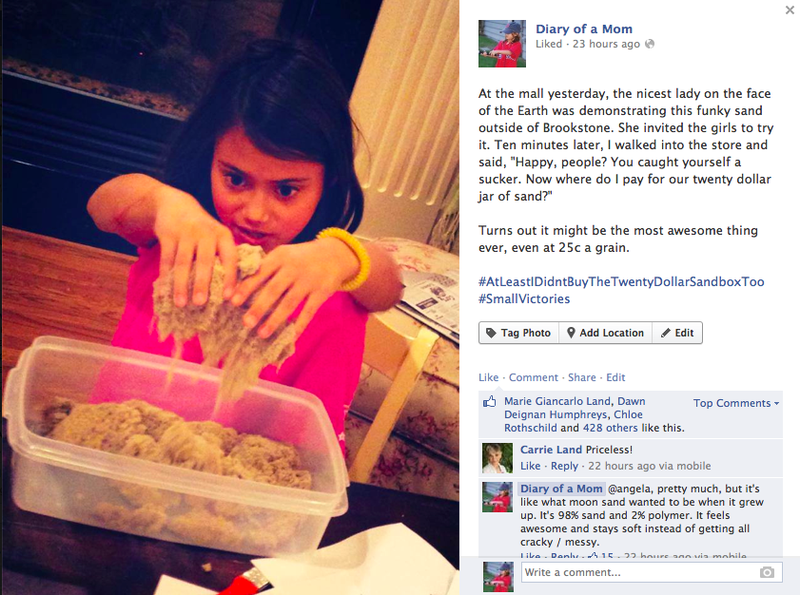 man, that brooke is just one amazingly awesome nifty super kid. she’s always changing, growing, and in doing so changing and growing the minds of people around her (and those of us lucky enough to be reading these descriptions). she’s a never-ending, one-kid revolution. Talk about absolutely PERFECT. I’ve always felt that, if nothing else, I want my son to know that I love him no matter what and that his happiness is paramount. For me, it has been the unprompted “I love” that has made all the difference. Just like you said.. on those days you’re just not sure you’re getting it right and feel like MOTY.. they find a way to let you know that they love you and it’s all okay! PRICELESS!!! I’ve been following your page on Facebook for quite a while now, as well as reading your blog here whenever you link it from your Facebook page. It’s amazing to see the progress that Brooke has made (fibs and all). I don’t know you or your family personally, but I feel like through your writing that I do know your family intimately. 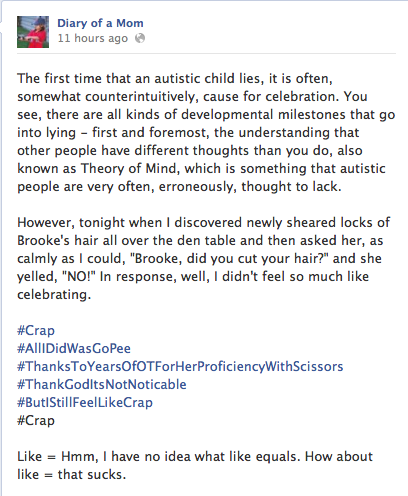 Reading your blog today made me feel pride for Brooke. It may seem odd, but I can honestly say I’m proud of Brooke for everything she has overcome this past year and the way she continues to prove drs wrong! Had a similar experience with my 4 year old last weekend. Have never had a back and forth conversation with her. And we had one – a great one! me: yup the doggie will stay here. Tears at the time – even her brother heard and knew how amazing this was. 1 year ago she couldn’t get two sylables out together, 6 months ago we were just scratching the surface of two word sayings. Have always known that the thoughts were in there – just needed a way for us to see/hear it.